Dripping with blood and gold, fetishized and tortured, gateway to earthly delights and point of contact with the divine, forcibly divided and powerful even beyond death, there was no territory more contested than the body in the medieval world. In Medieval Bodies, art historian Jack Hartnell uncovers the complex and fascinating ways in which the people of the Middle Ages thought about, explored and experienced their physical selves. In paintings and reliquaries that celebrated the – sometimes bizarre – martyrdoms of saints, the sacred dimension of the physical left its mark on their environment. In literature and politics, hearts and heads became powerful metaphors that shaped governance and society in ways that are still visible today. And doctors and natural philosophers were at the centre of a collision between centuries of sophisticated medical knowledge, and an ignorance of physiology as profound as its results were gruesome. 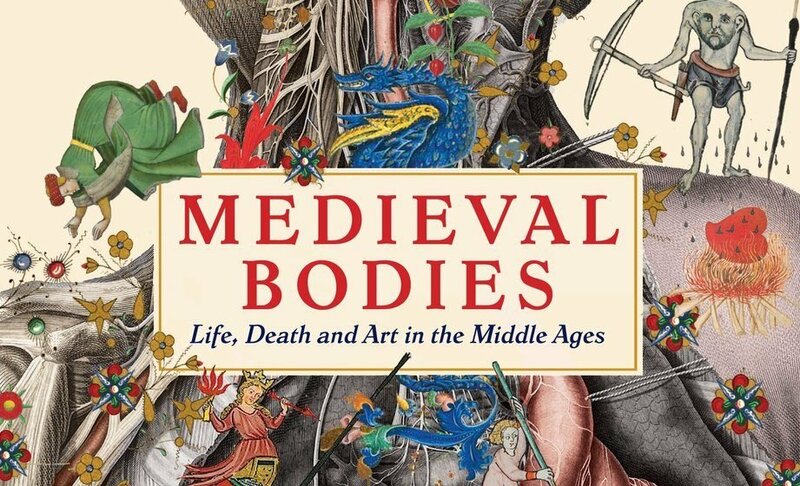 Like a medieval pageant, this striking and unusual history brings together medicine, art, poetry, music, politics, cultural and social history and philosophy to reveal what life was really like for the men and women who lived and died in the Middle Ages. Who would the medieval man or woman have turned to when their bodies began to fail? Although many are peppered throughout this book, it can be tricky to get a proper grip on the different healers that populated this medical world. Most left behind only the lightest of footprints on the historical record, and we are often stuck pondering them from little more than a name scribbled in a margin, the excavated foundations of a hospital or the fragments of a gravestone marked simply medicus, ‘physician’. But we do know that, like the Roman era before it, the earlier Middle Ages had no real state-controlled systems of medical qualification and no set path or expected background for becoming a trained doctor. Instead, local schools and institutional clusters taught a much more fluid form of medical curriculum, with particular regions becoming internationally renowned for their strengths in the healing arts. From the 700s onwards, Muslim Middle Eastern cities were amongst the most important centres for medicine, particularly well known for their ability to enrich the classical European texts they had preserved in Arabic with numerous Asian imports from Chinese and Indian traditions. Specialists in Baghdad, Damascus and Cairo built up extremely detailed and complex bodies of medical writings, as well as developing various new methods in surgery and pharmacy. These cities’ wealthy elites were also among the first to be moved by a sense of charitable giving to endow the earliest large-scale hospital complexes. These bimaristans, as they were known, could grow to an enormous size, complete with internal wards corresponding to specialisation and incorporating complementary services such as baths, libraries and teaching faculties. A Baghdadi bimaristan, founded in around 981 by the Buyid emir ʿAdud al-Dawlah, dramatically described by one visitor to the city as rivalling its largest palaces in splendour, was an expansive network of beautiful buildings open to rich and poor, male and female, and Muslims and non-Muslims alike. The reach of this Arabic-speaking medical expertise was impressive, stretching west across Muslim north Africa all the way to southern Spain, and practitioners in the rest of Europe benefited greatly from the ability to work at the pinch points between western and Middle Eastern cultures. Both men and women in the southern Italian city of Salerno, for instance, had by the eleventh century accrued a formidable medical reputation. Healing there was helped by Salerno’s position as a diverse cultural melting pot, combining the wealth and learning of its local Benedictine monasteries with proximity to both Arabic thinkers in Muslim Sicily and the classical heritage of nearby Greek-speaking territories. So apparently impressive was this multilingual Salernitan healing that wealthy patrons were willing to voyage from far and wide to seek treatment at the hands of its experts. In the 980s a bishop of Verdun named Adalbero even recorded undertaking an expensive cross-continental expedition to Salerno over the Alps from his diocese in north-eastern France, braving long and often dangerous roads just for an improved chance of cure. The steady growth of this cross-pollenated medicine was cemented in Europe by the emergence of the first universities, founded from the late eleventh century onwards in Bologna, Paris, Oxford, Cambridge, Montpellier, Padua and elsewhere. Rather than specialising in a particular medical field, university-trained physicians were encouraged to slowly accrue as diverse a breadth of knowledge as possible. The best students could discourse encyclopedically on many different aspects of bodily cure, especially those rooted in the sort of textual studies familiar to other more popular subjects like law or theology. But these themselves were far from diverse. Universities were open only to men, and men of good character and breeding at that, who were expected to subscribe to the moral and intellectual standards of what were largely religious institutions, as well as having the substantial wealth needed to support their studies. Moreover, this type of elite, theoretical and highly academic medicine would not always have been of immediate use when presented with an average actual sick individual: it is hard to imagine how a patient gushing blood from the head or in the throes of a violent fever would have appreciated an extended Latin quotation sourced from the Hippocratic Aphorisms, Johannitus’ Isagoge or Galen’s On the Utility of Breathing. In reality, such high-ranking university professionals were unlikely to have been the first port of call for many. These figures were very much the tip of the medical iceberg, a relatively small group of well-schooled, well-to-do individuals whose elite bearing and high prices saw them catering exclusively to the upper echelons of medieval society. Instead, for most medieval people treatment would have been sought from a far broader range of healers sometimes gathered together under the term ‘empirics’: surgeons, midwives, apothecaries, barbers, dentists, all considered more practically minded craftsmen and craftswomen. Although their work was underpinned by the same fundamental ideas – that the body was founded on balanced humours in deep confluence with the environment around it – these empirics differed significantly from their university counterparts in turning this understanding into practice. Theirs were professions learned not in classrooms but in workshops or in the field, serving as apprentices to more experienced masters in the same manner as young carpenters, butchers, potters or other artisans. Most would not have been literate, yet just as much knowledge was involved in craft as in academia. An apprentice surgeon would have to watch carefully at his master’s side for the minuscule subtleties of the knife moving over the skin, of the right way to apply salves and tie complex bandaging, or to pick up a cleverly deployed detail of expert bedside manner at just the right moment to reassure an anxious patient. While the physician’s knowledge was safeguarded by the elite Latin language, preserved on parchment in exclusive libraries, the empiric’s livelihood was protected through the keeping of professional secrets within family networks and artisanal guilds. These organisations could grow into powerful social institutions. In large cities such as Paris or Florence medical guilds patrolled the practice of their members while fiercely advocating for their rights and privileges, supporting craftsmen in old age or ill-health, overseeing local government and processing colourfully through the town on feast days with songs and banners. But neither physicians nor empirics necessarily needed to set up permanent practice in these major centres. Many were like the fifteenth-century French surgeon Jean Gispaden, who journeyed extensively to serve a wider range of clientele. We know of Jean’s work through a surviving notebook that he kept, its small, worn pages recording all sorts of details from his practice, and even some careful line drawings of his surgical instruments. These knives, pincers, forceps, scissors and other fierce-looking instruments would have travelled with him on his peripatetic surgeries, offering his skilled relief across a large area of the western Alps, trading his training and reputation for a potentially lucrative fee. With variation, though, came division among these many different types of healer. The literary learning of the universities carried a greater price tag and prestige than the gritty manipulation of actual bodies by surgeons and other empirics. In some centres the two groups were on good terms, working together to heal patients with their parallel expertise. But in others they seem to have inhabited totally distinct and even highly antagonistic social realms. Even today the terminology of modern medicine recalls the fractious diversity of this medieval moment: surgeons still choose the epithet Mr rather than Dr, avowing their profession’s origins in the world of tangible craft and not the doctoral confines of the academic university.